We talk about how much of an industry leader Yeti is every day. It’s become a day in day out affair here and you’re probably thinking at his point that you’d be very rich if you got a dollar for every time we said something along the lines of “Yeti is the gold standard of the industry”. But this bug hasn’t affected just us: it is something that has pervaded and permeated the entire coolers market. Everywhere you look, people want a Yeti. And if they can’t get a Yeti, then they’ll go for something that is at least like a Yeti in some respects. That, my friend, has sparked what we like to call the “battle of the knockoffs”. Let’s face it, there is little to hate in a Yeti. It comes with a great design overall. The cooler itself is rotomolded. The lid is well insulated, and so are the walls of the cooler. The ice retention on this beast is to die for. 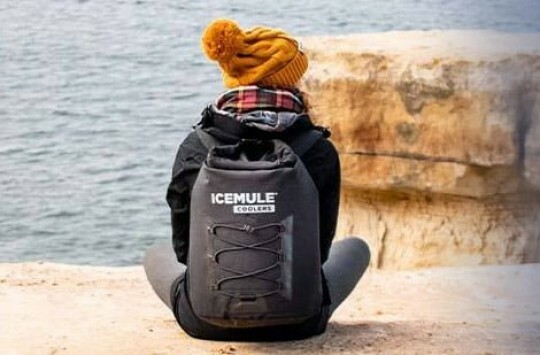 It’s got ice retention for days – literally! The latches are perfect quality, and so are the handles. The cooler is certified bear proof. As if that’s not enough, the accessories market for the Yeti is vast. 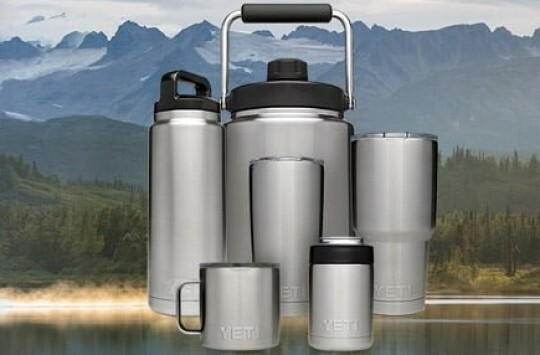 Yeti themselves already provide some cool accessories for their products, which puts them ahead of much of the competition. In addition, due to the great appeal and demand for these products, there are plenty of third-party vendors willing to customize your Yeti in just about every way you can imagine (wheels? sure! locks? sure! decals? sure!). That said, Yeti coolers are pretty expensive, so it is understandable that not all of us will be able to get ourselves one. Under such circumstances, it makes sense to find the next best thing: a Yeti knockoff. All I can say is that there are a lot of Yeti knockoffs. Most of the rest of the industry isn’t putting that much effort into being original. They just look at what Yeti did and try to reproduce it and then put the product on the market. Sometimes, if it weren’t for the conspicuous logo on the cooler, you wouldn’t be able to tell if you really were getting yourself a different brand of cooler. Some of them are practically indistinguishable from Yetis. 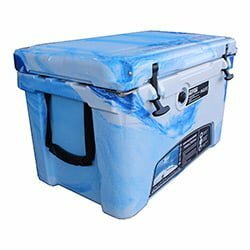 Granted, there are cooler brands that put in a lot of effort in the research, development, and design departments to make sure they come up with coolers that are both distinct and unique. However, they are in the scant minority. Now, don’t get us wrong. We’re not complaining. Sure, we’d like to see a lot more product differentiation on the market, but we also understand that having so many Yeti knockoffs might be an opportunity for those of us who can’t afford a Yeti to get something close in terms of looks and features, but not in terms of price. To start, we’ll take a look at some of the market leaders. These aren’t knockoffs of Yeti in the strict sense of the word. They have a personality of their own and they can pretty match Yeti in lots of aspects. They even, on the rare occasion, beat Yeti. Let’s look at them in turn. Pelican coolers are a great bunch. 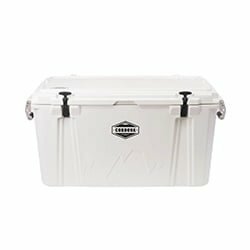 There are plenty of great lines under this brand, including the popular Elite coolers. Pelican coolers are fantastic when it comes to ice retention. They can actually match up to Yeti with the 10 days they will keep your ice cold. Most of the Yetis we’ve testes will go just over the 11-day mark. Pelicans, therefore, aren’t too far behind. The insulation is also state of the art, and one of the thickest on the market, matching up to the insulation you find on the Yeti. The latches on the pelican aren’t like the T-Rex rubber latches on the Yeti, but they still manage to keep the lid securely locked. They might be a little hard to handle for the weaker among us, but they do the job well. They also have wheeled coolers, which Yeti only just began producing for their own coolers (we mean the new Yeti Haul). Pelican also offers a limited lifetime warranty on their products, which is basically a statement by Pelican that their products are guaranteed to last for a very long time. These guys aren’t among the leading brands on the market by luck. They know what they’re doing; they understand their business, and they do it very well. 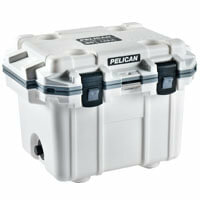 Verdict: If you’re not going to buy a Yeti, then a Pelican is the next best thing. 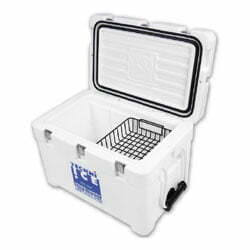 Yeti and Orca are both premium brands that specialize in ice chests and top soft-sided coolers. They are both American companies (although some Yeti coolers are made overseas) and they both have quite some loyal followers. With Orca, you get great variety when it comes to cooler sizes, which is pretty much a good match for the kind of variety Yeti offers. Orca coolers range from 20-quart coolers all the way up to 140-quart coolers. Yeti might beat them when it comes to higher capacity coolers (including massive 350 qt Tundra), but Orca can hold their own for the smaller capacities. 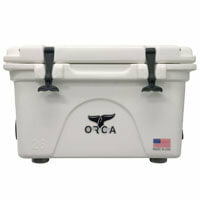 Orca’s coolers are 100% made in America and come with a lifetime warranty. The ice retention of Orca is just as good as that of Yeti. It will easily last you 11 days or longer, which is great if you’re going to be outdoors for a while and need to keep things extra cold. The security on the orca is great. There are drilled out corners on the corner where you can add padlocks if you want. 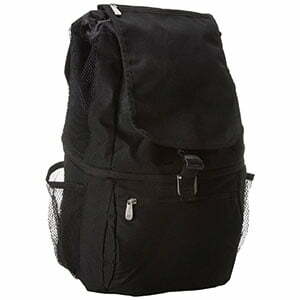 The latches are very secure and the lid, gasket, and walls of the cooler are particularly strong and good quality. The cooler itself is rotomolded, which means it will withstand just about everything you subject it to. This matches up to the quality of what you get on a Yeti cooler. Grizzly coolers are those coolers that you can practically make your best friend. 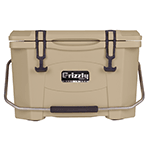 They can do everything and be everything, and they are in fact a perfect coolers for hunting (it might be good to mention that Grizzly supports NRA organization). To start with, they are rotomolded coolers (yes, like all of yeti knock-offs on this list), which means they have strong and virtually indestructible bodies. 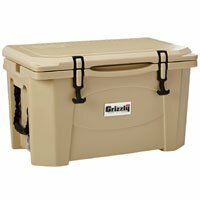 You can subject your grizzly cooler to just about any kind of stress similar to the ones it would go through in the wild and the cooler will gladly take it. The ice retention depends on the cooler size but ranges from 4 days on the lower end to 19 days on the higher end (weather and the way you use it are crucial here). Now, I don’t know about you, but I will take a cooler that can keep my ice icy for 19 days any day. They have a lifetime warranty, large drains that are easy to clean, customizability, which makes them great for hunting, and very great quality materials, including a thick rubber gasket for extra performance. They’re also certified bear resistant, which puts them comfortably head to head with Yeti. 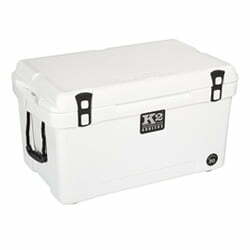 K2 coolers are all about making coolers with great value for money that keep your items very cold. They have worked very hard to live up to those principles and they are successful at it. 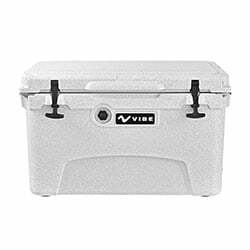 These coolers have plenty of great features that make them stand up to Yeti fairly easily. To start with, they offer plenty of variety when it comes to color, which is one of those features that make a cooler instantly desirable. They also have great stability, which makes it easy to transport them through rough terrain without having to worry about the cooler contents getting thrown around. These include non-slip bottoms. 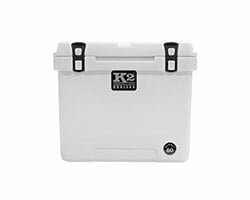 The handles on the K2 cooler are very strong and comfortable, with a good grip, making it both easy and comfortable to carry these coolers. The latches are great for sealing, they are compatible with dry ice and they are UV resistant. What’s not to love! When it comes to ice retention, there isn’t any exact data. However, they are known to keep your ice cold for several days at a time, even in hot sunlight. Here though, Yeti wins because the ice retention times for Yeti are simply legendary. There are the market leaders, which we talked about above. These are the ones everyone recognizes. They are just as good as Yeti in most aspects and are even sometimes better. They have plenty of unique features and have the quality of being very popular. But there are also cooler brands that you might not have heard of that do the job just as well as Yeti, or at least they try their best to come close. Usually, if you’ve got a nose for that kind of stuff, you can get a great bargain on these products because of the lesser popularity of their brands. We’re going to look at some of them in this section. When you have a cooler brand named after a Greek legend, then you know you’re on to something. 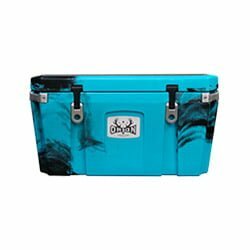 Orion coolers have gone a long way to make their ice chests pretty unique and capable of competing with the best of the best. They do pretty well when it comes to performance, though you shouldn’t expect them to give Yeti coolers a run for their money. The thing that really makes Orion coolers sell is the amount of attention to detail and passion that went into making these coolers. They have great variety when it comes to sizes, with coolers as small as 25 quarts and coolers as large as 85 quarts. This is a pretty decent range for the average cooler user, though it isn’t as wide as that of Yeti. They also have great variety when it comes to the colors of their coolers, even including camo options. That is where they do give a Yeti a bit of a challenge. 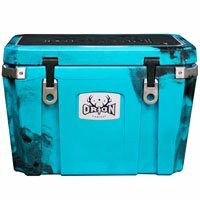 If you’re going to buy an Orion cooler for no other reason, then buy it for its color. 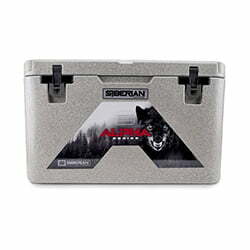 Some of the other great features included in these coolers are a great tray system, tie-down points for anchoring during transportation, bottle openers in the lid, certified bear resistance, great low profile latches, and handles with the resistance of a motorcycle. Something about the name itself hints at you that this cooler is pretty good with innovation. Kysek coolers are really serious about integrating the latest technology with their coolers and they have some pretty cool features because of that. Our favorite, by far, was the temperature sensor on the inside that works with an app you can download on your mobile phone. If that isn’t making a statement then I don’t know what is. The construction on these coolers is pretty solid. They are rotomolded and so, at least as far as their bodies are concerned, they are right up there with the best of the best. They actually have extra layers of polyethylene to beef up their insulation in the lid, the bottom, and the walls in the front and rear. That gives them some great insulation. They will keep your ice cold for up to 10 days. That’s not as great as a Yeti, but it’s pretty close. 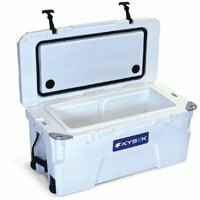 Kysek coolers also come with some great wheelers for easier hauling. They are built into every cooler and are pretty heavy duty, so they’ll handle any terrain. They also come with bottle openers in the lid, which any beer drinker will greatly appreciate. The handles are great, the design on the drainage is excellent, and the T-Rex latches are very effective at their job. They do look like Yetis, but they try to go the extra mile and make you forget you’ve seen that design somewhere before. Techni Ice is an Australian manufacturer of coolers. That’s the major reason why they aren’t so well-known here in the States. However, they have been the industry leader back in Australia for tens of years now. They aren’t just now venturing into this business; they’ve been in it long enough to know what works and what the customers want. You can be sure their coolers aren’t going to run-of-the-mill. The construction, as is expected of a top-quality cooler, is rotomolded. That means the body is indestructible and will withstand the harsh conditions of the wild outdoors. They also have the quality of being raised off the ground, which means, they won’t be affected by the heat coming up from the ground. They have dual air-locking seals, which are better than a single rubber gasket. This, at least, makes their coolers serious contenders against Yeti, if only they were more popular. The coolers are certified bear resistant and will last pretty long. They have a great range in terms of sizes and even sell soft coolers, which spells diversity in our dictionary. This is the Yeti of Australia; it’s only a matter of time before it becomes popular here as well. Cordova coolers are made in the USA and claim to have the best ice retention in the world. That’s a great claim. Well, they do have the best insulation in the market. And they will keep your ice cold for many weeks on end. The coolers are rotomolded and have a great rugged design which we honestly think beats the Yeti look on any day. They are also bear proof, have tie-down points, anodized drain plugs, a temperature sensor, and a very secure lid locking system. They don’t offer as many size options as Yeti, however. Okay, so we’ve looked at the bad and the hidden. Now we’re going to take a closer look at the ugly. They’re the kind of coolers that you only go for when you pocket absolutely cannot take anything else. They do the job, at the bare minimum, and they will keep your ice cold long enough for you to think you made a great choice before quickly coming back to your senses. However, if you can afford it, we would still advise you to try something a little better in terms of performance, even if it means forking out a few extra dollars. RTIC coolers were made for campers, hikers, and other outdoor enthusiasts so they could have something that does the job without having to pay an arm and a leg for a Yeti. To start with, they keep things simple with the sizes, not offering too much in terms of variety. 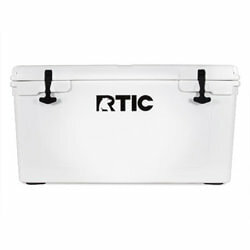 Their greatest size offering, however, is the RTIC 145 quart cooler, which is pretty good. The chest is rotomolded, which is great, it has great insulation quality and will keep your ice cold for up to 10 days. Other than that, the other notable features are T-Rex latches, a good quality gasket, a good and comfortable handle, and tie-down slots. These coolers are simple but effective. Just like their name might suggest, they are all about spreading the good vibes. They were specially made to withstand the harsh conditions that kayakers go through. They are roto-molded, have 3-inch walls, protection against UV radiation, secure T-Rex latches, an air-tight gasket, and a pressure release valve, which we think is a pretty neat idea. They also include bottle openers on all four corners of the cooler. Perhaps the greatest feature on these coolers are the fish rules for measuring your catch, which is great for sports fishing. They don’t offer much variety on the sizes and the colors, though. Siberian coolers don’t presume to do the big stuff in big ways. They focus on delivering the little things with an impact. These coolers are all about keeping your food and drinks intact for those intimate get-togethers where you want your cooler to perform just well enough. They only offer 4 available sizes: the 22-quart cooler, the 45-quart cooler, the 65-quart cooler, and the 85-quart cooler, which is good enough for the range of applications. These coolers are rotomolded, come with anodized aluminum latches, non-slip bottoms, dry ice capabilities, tie-down slots, a cutting board, and a lifetime warranty. We simply love them for the good quality simplicity. These coolers are just right when it comes to storage capabilities. They have a small lineup in terms of sizes, but they are well distributed that there is something for everyone. Their largest cooler, the 70-quart Milee, is even wheeled for extra comfort. It’s the little things like that that really matter to us. The construction on these coolers is rotomolded. The bottom is anti-skid. The handles are strong and have a comfortable grip, the T-Rex latches do the job sufficiently well. The plastic is food grade, the seal in the lid is refrigeration D-Seal, which makes it airtight, and each cooler comes with a pressure release button for when the lid is extra hard to open. If you can’t afford a Yeti, then there’s no need to despair. You have a lot more options than you think out there. 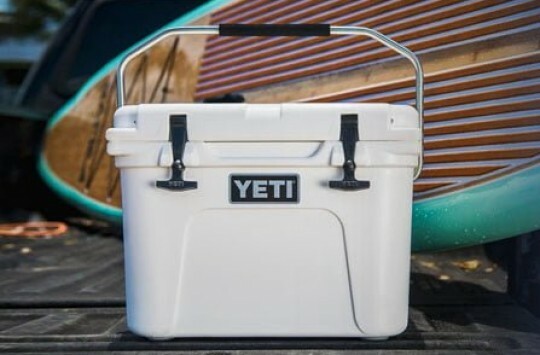 While we agree there should be more differentiation in the coolers market, we also think it’s a good thing for there to be great quality Yeti knockoffs for Yeti lovers who want the Yeti experience without the Yeti cost.